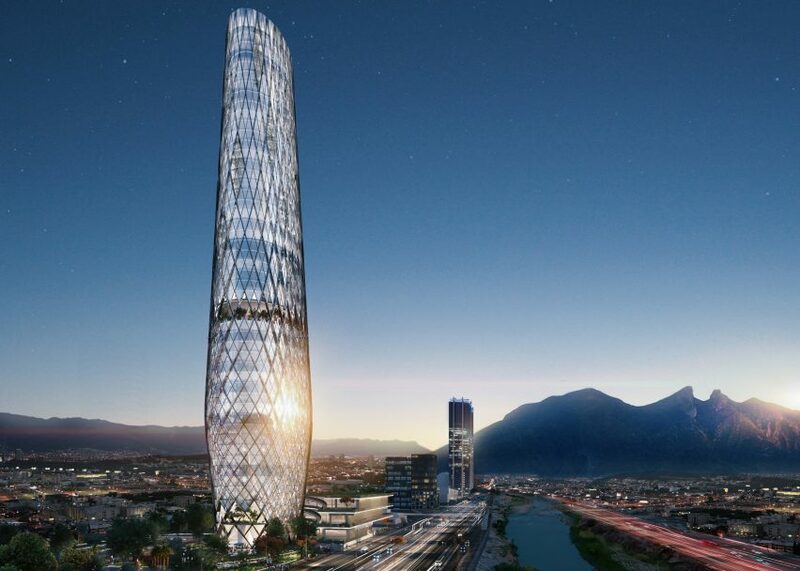 Stepped roof gardens will be built up around the latticed glass skyscraper that Mexican firm Sordo Madaleno Arquitectos has designed as part of a new mixed-use complex in Monterrey. 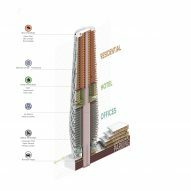 Sordo Madaleno Arquitectos developed the Constitución 999 tower in response to an international contest, which was seeking proposals for a plot along Constitución Avenue in the Mexican city's downtown area. 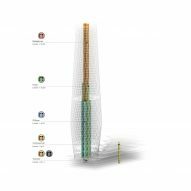 The architecture studio's winning design includes for a 228-metre-high tower, which will contain shops at its base, a hotel in the middle and residences at the top. Featuring an elliptical floor plan, the skyscraper will slightly expand from the base, before tapering inward towards the top. A diamond-patterned facade will form the main structure with glass walls set behind. The glazing will offer views of the building's circular floor plates from the outside, and vistas of the surrounding city from within. Images also suggest that the latticed structure will be laced with planting. 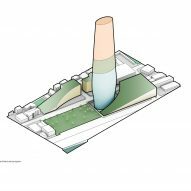 Along with the tower, Sordo Madaleno Arquitectos has masterplanned the surrounding site. Competition judges, Monterrey-based developer Proyectos 9, said that this feature gave the project an edge above other entrants. The tower will be placed at the centre of the site, where four plazas converge. One of these is home to the city's Square of the Composers and will be developed with planting in semi-circular plots. Three volumes will be built on the others and curve around the tower to form an elliptical opening at its base. 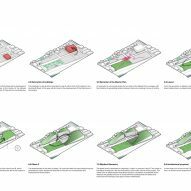 "Integration, appropriation and revitalisaton are the thre factors that became the design bases of the winning project," said Sordo Madaleno Arquitectos. 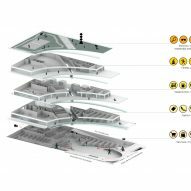 "An architectural exercise where not only an isolated project was proposed, but it extended its physical barriers to its immediate context to generate a dialogue with the city and achieve the purpose of regenerating the public spaces of the area, such as the Plaza de los Compositores." 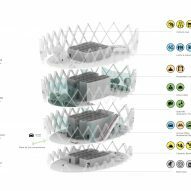 The staggered levels of the smaller structures will form stepped roof gardens that house parks and sports facilities. Shops, restaurants, bars and cafes, and a fitness centre will occupy the floors inside, with car parking located underground. Based in Mexcio City, Sordo Madaleno Arquitectos was founded in 1973 by Juan Sordo Madaleno. The architect, who died in 1985, is regarded as one of the most important Mexican architects and worked with other influential figures including Luis Barragán and Ricardo Legorreta. Madaleno's son Javier Sordo Madaleno Bringas has run the firm since 1982. Among the studios most recent projects is a tower in Guadalajara comprising stacked and offset boxes.